This page is about the American fighter P-51. For other uses, see P-51 (Family). The P-51 Mustang is a rank III American fighter with a battle rating of 4.0 (AB/SB) and 3.7 (RB). It was introduced in Update 1.49 "Weapons of Victory". The P-51 Mustang retains a lot of the traits that may be found in its later variants. The main difference comes from the limited Allison power plant and its formidable armament of 4 x Hispano Mk.II 20 mm cannons. The plane may not climb very well but does retain the traits of an energy fighter. Even with is limited climb rate the aircraft's dive-speed is excellent. The aircraft's manoeuvrability is average at best. The armament is the true advantage of this aircraft. The best way to use the P-51 is for Boom & Zoom. The 20 mm cannons are powerful, but with only 500 rounds do not try to go for more than what the P-51 can handle. 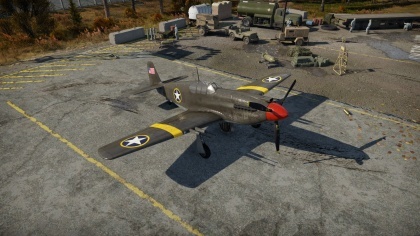 The P-51, when fully upgraded, is an extremely deadly opponent, especially as a rank II. The engine will have a hard time hitting the "overheated" mark, even when using WEP. Use caution though, as the engine will retain its heat when constantly on 100% power, so it takes a bit to cool down. Also be sure to utilise the flaps: they are a major asset to the plane's overall turn-fighting ability and sometimes allow it to survive a Russian turn-fight. This is an awesome plane for those just starting out in Realistic Battles, as the 20 mm cannons are good at scoring quick victories. The P-51 Mustang can seem a very underwhelming aircraft at first. The primary module to focus on for early success is the 20 mm Ammo Belts. Ground attack belts will give a more consistent results as an attacker and the Air Target belts can be devastating against flying opponents. After improving the firepower on the aircraft, begin focusing on performance upgrades. 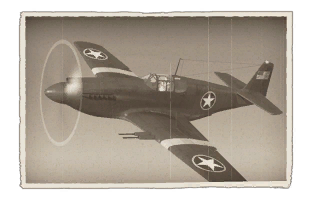 Priority target when in AB mode due to its reputation of destroying planes with relative ease, smart players will try to eliminate the P-51 first. Minimal elevator authority without the engine producing net thrust as the plane relies heavily on streamline effect along the tail for elevator authority. Aircraft should not be landed with flaps down without an engine. The North American P-51 was born when the British Government showed interest in purchasing the Curtiss P-40C. Curtiss was at max production capacity, so the British inquired to North American Aviation if they would build it under license for them. North American agreed, but they wanted to build a better aircraft. A condition of the sale from North American to the British was to supply the U.S. Army with two samples free of charge. The original prototypes were designated XP-51. The U.S. Army was given fourth and tenth aircraft. One of them can still be found at the EAA Museum in OshKosh, Wisconsin. Testing of the two prototypes started in October of 1941. The new aircraft received high marks and were clearly superior to other U.S. fighters at that time. Although, the U.S. Army decided to not immediately place orders. The first order of Mustangs to the British were designated Mustang I. The RAF received these aircraft behind schedule in October of 1941. Problems showed up immediately including the Allison power-plant and other design flaws. It is also important to note the Mustang Mk I's armament consisting of four .30 Cal machine guns mounted in the wings, as well as a set of two .50 Cal mounted in the wings and two .50 Cal machine guns mounted in the nose. The next evolution of this aircraft was designated Mustang Mk IA. Due to the recently signed Lend Lease Act the U.S. Army was able to place an order for 150 more Mustangs on behalf of the British. These aircraft were equipped with four 20 mm Hispano Mk.II cannons mounted in the wings. Only 93 of the new Mustangs made it to the RAF. The U.S. Army pulled 55 for themselves and they immediately saw service. Two were kept by North American Aviation for internal use. These P-51 Mustangs first saw service in April 9th of 1943 and the first combat loss came shortly afterwards on April 23rd. Mustangs saw action against the Japanese in the Aleutian Islands but a majority of them found their way to the Mediterranean theatre. The Mustang saw combat early on in the country of Algeria. Over time these P-51 Mustangs were converted to Reconnaissance planes. A K-24 camera was placed in the left window behind the pilot. The camera faced towards the back and down and took pictures providing battlefield reconnaissance. These aircraft saw continued service until the later part of 1944 continuing to fill the Attacker and Recon role. The North American P-51 Mustang was a single seat fighter which was designed, developed and entered service all during the course of the Second World War. The origins of the aircraft came about in April 1940, when the British Purchasing Commission approached the North American aviation company to design a fighter to augment those already in service with RAF Fighter Command. The prototype first flew on October 26th 1940 and, after a highly successful test and evaluation period, 320 aircraft were ordered and the first production aircraft flew on May 1st 1941. Delivered to No.26 Squadron at Gatwick, the new American fighter was designated the Mustang Mk.I by the RAF. It was considered to be superior to any other American fighter at the time, particularly at low level. However, the 1100 hp Allison V-1710 engine had a poorer performance at high altitude, particularly above 15,000 feet which was above where the engine supercharger was optimized for. For this reason, the Mustangs were used in support of ground operations rather than in their intended original role as a fighter. The Mustang was very successful in this role and an additional order for a further 300 aircraft was placed. The new batch was modified by fitting self sealing fuel tanks and replacing the earlier Mustang's eight machine guns with a new armament of four 20 mm cannon, to create the Mustang Mk.IA. The RAF's successes with the Mustang led to a good deal of attention from the United States Army Air Force; after highlighting the fighter's only serious shortcoming as its high altitude performance, inquiries were made into fitting the aircraft with a different engine. The British Rolls-Royce Merlin was selected for testing in five converted Mustangs, and the performance of the fighter increased dramatically. The airframe and wings were strengthened to harness the power of the Merlin engine, which also resulted in the fitting of under wing stores now being an option. Mustangs could now carry bombs, rockets or long range drop tanks. Now more than capable of competing across all altitude bands and boasting a particularly long range for a single engine fighter, the Mustang was rapidly evolving into one of the most capable air assets of the entire war. However, with British and American interest in the fighter still growing, future variants of the Mustang would show yet more improvements. Generally regarded as the greatest American fighter of the Second World War, Mustang pilots were to claim nearly 5,000 air-to-air kills by the end of the conflict. The Mustang would go on to serve the USAF in the Korean War, and was exported to over 50 foreign air forces.